This activity book is packed with mazes, coloring pages, crossword puzzles, word searches, and more. 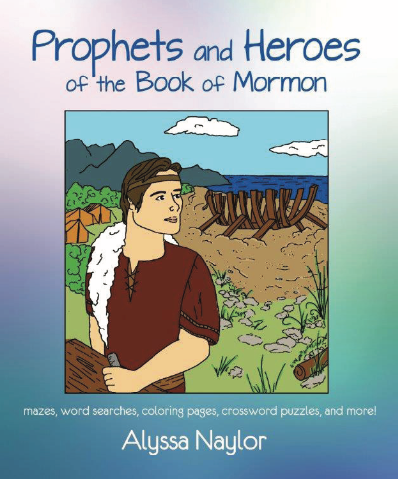 Each page focuses on a prophet or hero from the Book of Mormon such as Nephi, Alma, Mosiah, Abish, Samuel the Lamanite, Captain Moroni, Sariah, Mormon, and many others. Children will have fun as they learn about people who acted on their faith in Jesus Christ. Alyssa Naylor has enjoyed art since she was a young child. As she has developed her artistic skills, she has found opportunities to share her creativity at home, at school, and in the community. Alyssa’s art has been featured at numerous art exhibits, and she has received a Best of Show award. In school, she was honored with the Outstanding Art Student award. Professionally, she has done portrait work in both ink and oil paint, designed corporate logos, and created artwork for a wood-etching company. I-Spy for LDS Kids, More Mazes for LDS Kids, and More Color-by-Numbers for LDS Kids are Alyssa’s first published books. She served an LDS mission in Montevideo, Uruguay, and currently attends Weber State University, where she is studying music and medicine. Alyssa enjoys the outdoors, running, soccer, tennis, playing the flute, and spending time with her husband and her family.